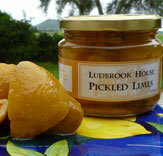 Ludbrook House and Farm Estate, Walks, Tours, Registered Garden, Artisan Food Products, Bay of Islands New Zealand. Sam and Chris Ludbrook introduce you to the farm's 154 year history and to their special relationship with this land. At Ludbrook House the orchard supplies the bulk of the figs, limes and plums which, with other Northland fruits, is turned into some of the 34 gourmet food products handmade in the on-site commercially registered kitchen. Chris promotes Northland's semi tropical produce in two ways; her gourmet food business and Savouring the Sauce, a food and wine festival held yearly at the Bay of Islands Pastoral & Industrial Show. 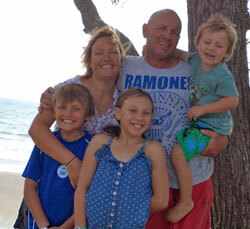 Sam has retired from farming and helps manage Ludbrook House and the gourmet food business. Sam & Chris are both life members of the Bay of Islands Pastoral & Industrial Show. In 1860 Samuel & Caroline Ludbrook, Sam's great-grandparents, purchased 1000acres of prime farmland from John Williams, Caroline's brother and son of the missionary Henry Williams. Roger & Carol, Alexandra, Henry & Fin. The family history in New Zealand dates 190 years back to the arrival in Paihia of Sam’s great-great grandfather, the Reverend Henry Williams and his wife Marianne. From the beginning in 1860 this site has nurtured six generations of Ludbrooks. Ludbrook butter, we believe to be the first butter made commercially in the Bay of Islands, was carted by horse and bullock 30km to the market at Paihia. 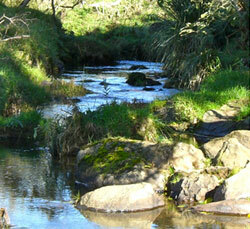 The land, is called Tupe Tupe after the waterfall on the major stream that runs through the property. Tupe Tupe extends across the important archeological area known as the Taiamai garden, formed from the volcanic eruptions of the mountains Pouerua, Maungatoroto and Te Ahuahu. Evidence of these eruptions is obvious in the outcrops of the rock strewn across the landscape and the light volcanic soil mingling with patches of clay and loam. 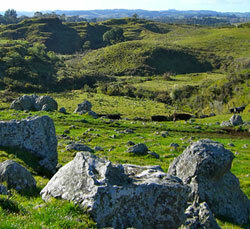 Random rock formations lead to Rua Hoanga pa. Rising deep below the soil and rocks are many springs bringing pure artesian water to the surface to form clear streams, rapids and waterfalls along with ponds and marshes. 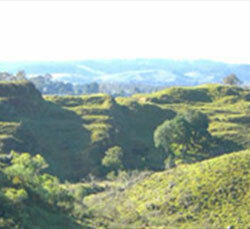 Roger Ludbrook has initiated extensive planting and fencing designed to protect the waterways and wetlands. 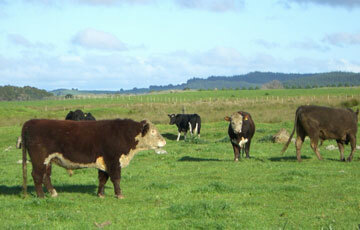 Currently the farm grazes 840 head of cattle consisting of a mixture of cows and finishing bulls. It was this pristine and wonderful land that welcomed the Maori when they first migrated to New Zealand sometime around the 12th century. Maori settlers moved from the coast of Northland to the inland country with the changing seasons. It could not have taken them long to discover the nutrient rich and well watered volcanic soils of the Taiamai plain where they established seasonal gardens, burning the virgin bush and foliage and clearing the rocks to establish and work many acres of gardens. Evidence of these gardens remain to this day. In times of conflict they retreated to the pa sites they established on higher clay soils choosing ridges with natural attributes for creating defensive villages. These pa sites appearing as sculptured land forms are easily seen and recognized on ridges and hills on and adjacent to Tupe Tupe. Rua Hoanga Pa, within Tupe Tupe farm, is a well preserved and fascinating example of the skill and ingenuity practiced by Maori in pre- European times. Tapa-huarua Pa and Taka-Poruruku Pa are visible on the ridge opposite Ludbrook House from State Highway One. ‘We rose early this morning (October 20th) and prepared for our journey to Taiamai’ (from Rangihoua, Bay of Islands).